Noell Vawter at Worth Avenue Yachts sends word of a further $350,000 price drop on Picchiotti’s 46m world-roaming motor yacht Golden Compass, a joint listing with Ocean Independence. Golden Compass was the winner of the Voyager’s Award at the 2012 World Superyacht Awards following a 30,000-nautical mile world tour. 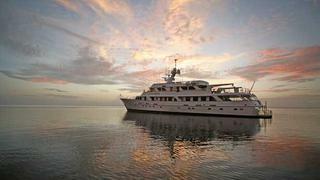 Built in 1982, she’s been consistently maintained and upgraded since, including major refits in 2009 and 2011. She is now technologically modern and especially comfortable. Many of the interior areas including the master suite, guest staterooms, main saloon, dining saloon, sky lounge, captain's cabin, crew quarters, and all heads were completely renovated. Accommodation is for up to 12 guests in six staterooms, and twin 900hp Caterpillar engines give her a range of 3,800 nautical miles. Golden Compass is now down from $6.15 million to $5.8 million.